This isn't your typical word search puzzle. Not only will kids improve their spelling skills by completing the puzzle, but they will learn something about the holiday while reading the text to see what words are in the puzzle. Just scroll down and click to print this puzzle. Directions: Read the following passage. Then find the capitalized words in the puzzle. Mothers Day is a MODERN holiday in the United States, created by ANNA JARVIS in the late 19th CENTURY. 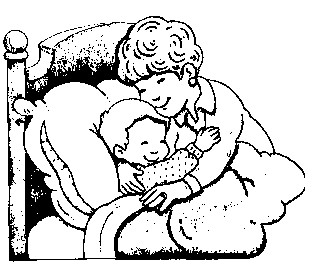 This day HONORSmthe state of MOTHERHOOD. 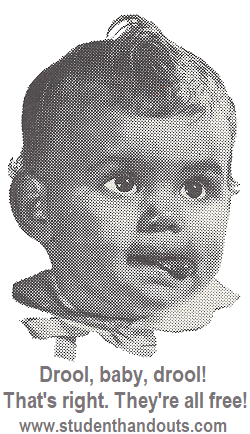 Mothers Day in the UNITED STATES is CELEBRATED on the second SUNDAY in MAY. On Mothers Day, FAMILIES often come together for a SPECIAL dinner. Mothers are given GIFTS by their CHILDREN. These gifts are often HANDMADE. Mothers often receive FLOWERS on Mothers Day, particularly CARNATIONS. 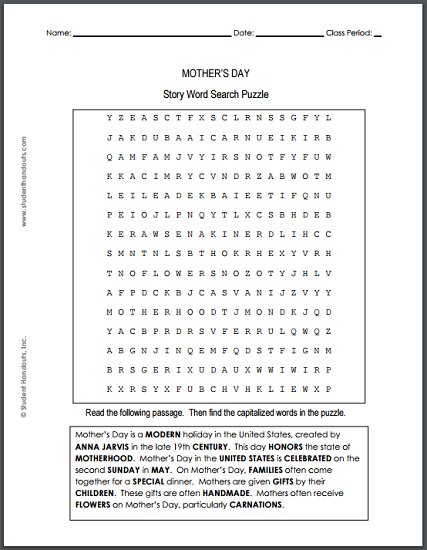 Click here for more free puzzles, worksheets, games, and activities related to Mother's Day.